St. Thomas, the apostle of Lord Jesus came to India in AD 52 and preached the Good News. He established Christian communities at different places in Kerala. 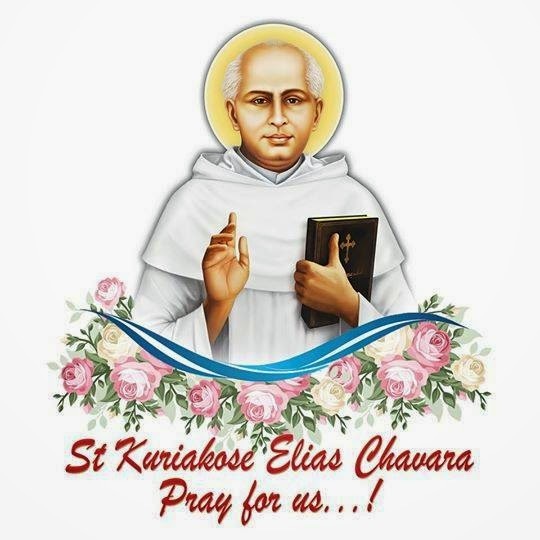 The Community established by him at Niranam, in course of time, grew in number and many Churches were founded afterwards to fulfill the sacramental needs of the faithfuls. In AD 417 St. Mary’s Church at Kalloorkatt (Champakulam) was founded. 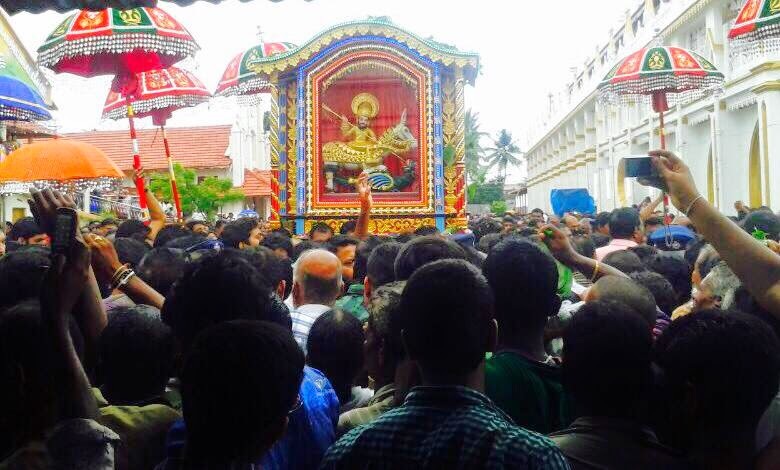 The Christian Community in and around Edathua, now journeyed to Champakulam for carrying out their spiritual needs. These people were hard working and led a simple life. They lived in lands retained in the vast paddy fields of Kuttanadu. The Community grew in number as members from Shankarapuri family, one of the Brahmin families converted by St.Thomas, who had then settled down in Kuravilangadu, on the Southern side of the Church and hence known as Thekkedathu, came to reside at Edathua. 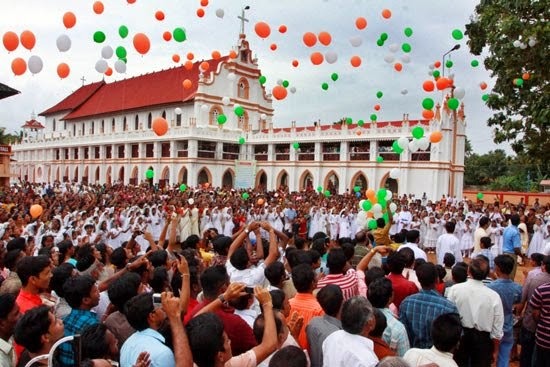 Besides, the support extended by the Royal Family of Chempakassery, Ambalapuzha, which had connection with the Kudamalloor Community, prompted many of them to come and settle down in Kuttandu. The brisk growth of the Christian community here was an impetus for founding Churches at Alappuzha in 1100 at Purakkad in 1410 and at Pulincunnoo in 1557. The founding of the above Churches kindled a strong desire in the minds of the faithfuls in Edathua. They prayed and waited patiently to have a Church of their own. Rev. Fr. Geevarghese Valiaveettil Kathanar, who was the first priest from Edathua, inspired and motivated the laity, and with the assistance of few prominent people like Kurian Tharakan Ooramvelil, Pothan Mappila Thekkedathu, Mathan Mappila Methikalam, Chekkidikadu, Thommi Mappila Vettuthottunkal, initiated the move for a Church at Edathua. 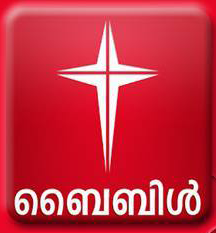 The Vazhappuzha Vicariat was established and the administration of the parish under the Archdiocese of the Kodungalloor was handed over to the new Vicariat. The move to construct a parish Church at Edathua got intensified and the representatives of Edathua under the leadership of Fr. 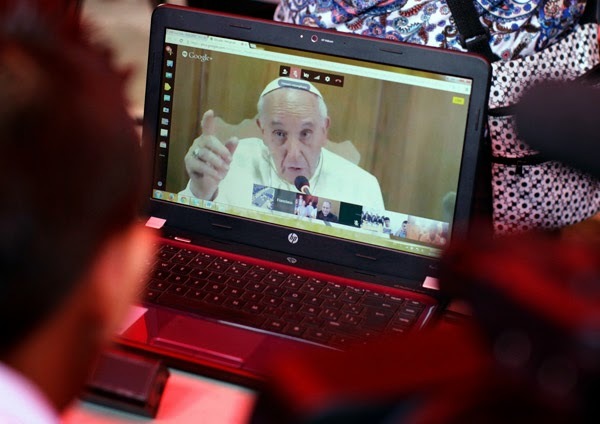 Valiaveettil Kathanar convinced the Apostolica, of their need and finally Most Rev. 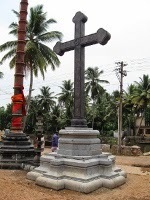 Raymond the vicar Apostolica granted the canonical permission for the Church at Koilmukku in 1810. There was a reclaimed land, on the western side of river Pamba that flowed north wards and was surrounded by ancient Catholic families of Kurumkattumoolayil Cheppattu, Thyparampil Attumalil and Padinjarekkara; The Land belonged to a prominent Hindu Nair family karanavar Shri Kocherukkapanicker a magnanimous person. He gave the Land free for the construction of the Church September 29,1810 (M.E. 986 Kanni, 14) the foundation stone was laid. With the whole hearted support of the faithful a small Church in the tradition of St. Thomas Christians with Thora, Hykala and Sankirthi was built. Thus the dream to have a parish Church of their own materialized and with enhanced fervour they attended the services held in the Church. The new parishioners, though not financially well off, were resolute and hardworking. They were engaged in agriculture and trade. They planned to build a biggie Church and in November 1839, the foundation stone was laid for the present Church. Meanwhile a cemetery Chapel was also built. The new Church was in the name of St.George and naturally they desired have a Statue of the saint. 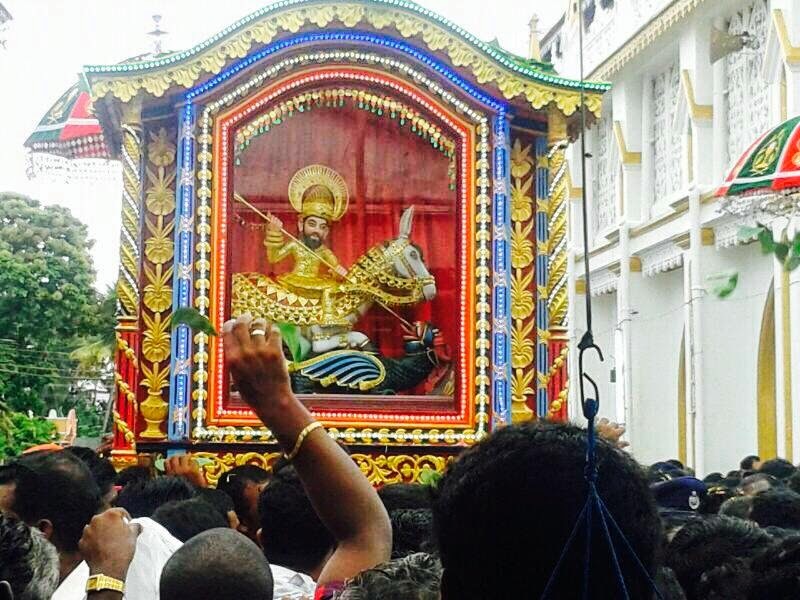 They found a statue of the saint kept in the attic of the Edappally Church and decided to take it. Tradition says that strange events happened in the Church as this unused and abandoned Statue of the saint was taken out of the Church. Believint that Saint’s miraculous power accompanied the statue; many devotees flowed to Edathua Church especially during the Saint’s feast conducted from April 27th to May 7th of every year. The Saint’s intercession brought thousand of pilgrim to Edathua and Edathua in course of time under many changes, finally growing into a business center. The visionaries who foresaw these chanper impressed up on the parishioners to establish educational institutions. The first Malayalam School was established in 1888 and seven years later, St. Aloysius’ English School also started functioning which was upgraded as High School in 1902. Schools were also established at various Sub center of Edathua like Pacha and Pandankary. Also Church at Sub center were also founded apparently the natives of Edathua prospered and progressed and Edathua came to be looked up as on the center of Education and commerce. Meanwhile the Church building was strengthened and beautification works under taken many times, all of which culminated into the beautiful edifice we have today. The blessings received through the intercession of Saint George transformed Edathua into permanent Pilgrim center of South India. The natives of Edathua from the beginning were very religions and pious. This rich religious Soil gave birth to a saintly soul like Puthenparampil Thommachan the founder of Franciscan third Order. Moreover the seeds of a great congregation of Sisters, SABS were also sown in the soil. The religious harmony that existed here is worth mentioning. People belonging to different religions, inspired by a fraternal love, encouraged and assisted each other promoting each one’s development. The religious atmosphere and the Saint’s presence prevented any untoward incident. Each and every native of Edathua fervently prayed to the Saint and strongly believed in his intercession. They all had a strong attachment to the Edathua Church.